12 Ft , 16 Ft , 18 Ft , 21 Ft , 24 Ft , 28 Ft , 32 Ft.
20 Ft x 12 Ft, 24 Ft x 12 Ft, 28 Ft x 12 Ft, 32 Ft x 12 Ft, 24 Ft x 16 Ft, 28 Ft x 16 Ft, 32 Ft x 16 Ft, 34 Ft x 18 Ft, 41 Ft x Ft 21 Ft.
40 Ft x 16 Ft , 44 Ft x 12 Ft. Contemporary Styled Verticals - These 7" verticals compliment the powerful beauty of this pool. 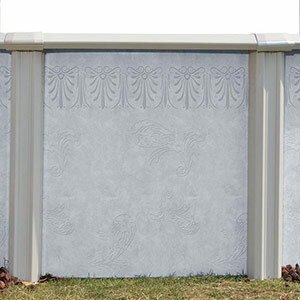 Super-Wide 8 1/2" Top Rail System - Classic 8 1/2" top rails provide rock-solid stability and durability. Com-Pac™ II Oval Support System - Superior Engineering to maximize your pool! No other manufacturer can provide you with the space-saving features of the Com-Pac™ II. Zinc Clad™ 11000 - Hot Dipped Galvanizing and numerous protective coatings for protection and corrosion resistance. 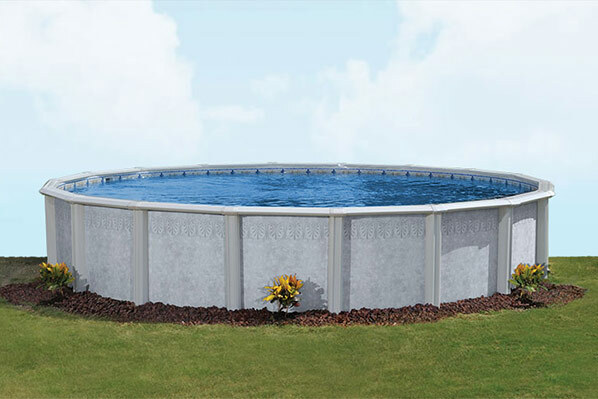 Liner Exclusives - The only above-ground pool manufacturer that produces virgin vinyl liner material made to original Doughboy specifications and are available in a variety of decorative patterns. Exclusive Therma-Seal™ Technology. - This proprietary fusion method provides superior sealing for maximum durability and quality. Unmatched in the industry. We are so confident with this process that we cover the seams of our liners 100% for a lifetime.